We visited Sweetie Pie's on a Saturday at about 2 p.m. The line was out the door but moving. We watched people coming by the carloads. There were many out of state license plates. 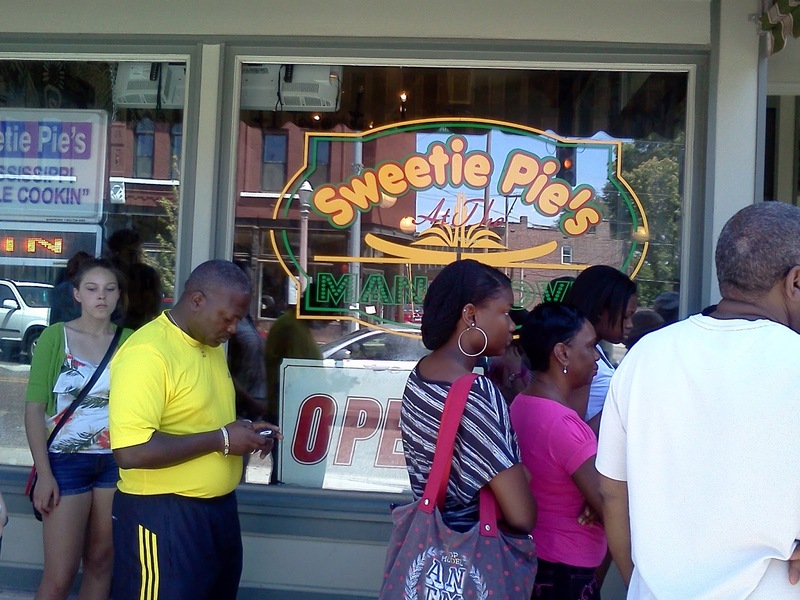 We talked to one woman in line who had drove 4 hours from Kansas City to dine at Sweetie Pie's. There were also many Cardinals Baseball fans who dropped before the game to get a bit to eat at Sweetie Pie's which is now a major tourist attraction. 1. Be patient. This is an outing for the day. 3. Look your best. When you enter the doors of the restaurant you agree to be filmed on their popular reality TV series Sweetie Pie's. 4. Be prepared to wait. Did I say that already? We waited to get in the door to discover more lines inside the restaurant. 5. Flash cameras are not allowed. Have a camera ready you may be able to get a photo with one of Sweetie Pie's Reality TV Stars. 6. Take some extra moolah with you to purchase a Souvenir Sweetie Pie's T-shirt. 7. Donna recommends: Sweetie Pie's Fried Chicken and Sweet Potatoes. This is worth the wait. 8. Janice "Skychi" recommends : Sweetie Pie's Fried Catfish. This is worth the wait! 9. Customers recommend Sweetie Pie's Baked Mac 'n Cheese. It is in hot demand. Going! Going! Gone! This is worth the wait. 10. Sweetie Pie's Menu Prices are not listed on their website. We chose 1 Chicken Dinner with two sides and 1 Catfish Dinner with two sides plus Sweet Tea and Lemonade for our drink selection and 2 Peach Cobblers for dessert. Our meal tab totaled $35 for two people for lunch on a Saturday afternoon. Oprah's visit to Sweetie Pie's has put St. Louis Grove Area on the Map. Sweetie Pie's is a Reality Show on Oprah's OWN TV Channel. "When Robbie Montgomery – one of the original back-up singers for 1960's soul duo sensation Ike and Tina Turner – toured with the band, she poured her creative gifts into her cooking as much as her singing. After the singing stopped, Robbie took her mother's soul food recipes, passed down through generations, and created the empire known as "Sweetie Pie's," St. Louis' iconic and wildly popular soul food restaurant run by Robbie and her dynamic family. Welcome to Sweetie Pie's follows the loud, loving and still very musical Montgomery family as they struggle with the demands of expanding their family-owned business, one soulful dish at a time." Have you dined at Sweetie Pie's?